Miss Gest is the games teacher, as well as our class teacher. She's a green grarrl with short black hair and solid legs like tree trunks. She wears great thick spectacles like the bottoms of jam jars and she has a bellowing voice that you can hear from the other end of the playing field. And you should just hear they way she yells at us. "You have two minutes to get changed, starting from.... NOW!" She shouts standing in the corridor between the boys' and girls' changing rooms. And woe betide anyone who isn't in their shorts, t-shirt and plimsolls by the time she blows that horrible shrieky whistle she wears on a blue ribbon around her neck. I was walking to school one Monday morning and I hadn't called for Keriso that day, partly because I was still sulking about her spoiling my mum's best sheets over the weekend with a hair-brained scheme, and partly because the postman had just given me a letter with a Kiko Lake postmark and I wanted to read it in peace. The letter was from my grandma, a plushie Kiko who I am very fond of. 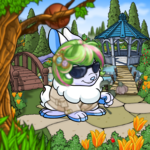 And I got a very nice surprise when I opened it because there was fifty Neopoints inside, as well as a belated birthday card with a picture of a plumpy on the front, who looked just like my petpet Cortana. I was smiling at the card when I heard Keriso's voice behind me. "Eastly," she called. "Wait for me." I waited until she caught up with me. She was all out of breath from running and she looked so pleased to see me, that I hadn't the heart to be cross with her anymore. We linked arms and walked on together, I showed her the plumpy card and started to read out the poem written inside. But I soon stopped because I could see she wasn’t listening. "I've got something to tell you, Eastly," she said. "Only you must promise not to give the game away." She kept breaking into chuckles and giving little skips in the air as we went along. "Do you promise? Cross your heart?" "You're up to something," I said sternly, stopping on the pavement and staring at her mischievous face. "Come on, Keriso. What is it this time?" "Wait 'til you see what's in my satchel," she said giggling more than ever. "That Miss Gest is going to get the fright of her life." She started to tug my arm. "Stop dawdling, Eastly. We have to get to school before she does." We arrived at the school gates at half past eight and there was still hardly anybody about. We hung our blazers in the girls' cloakroom and then took our satchels along the corridor to the classroom. I hung mine on the back of my chair, but Keriso went straight over to Miss Gest's desk and lifted the lid. "Keriso!" I said, in a shocked voice. "What are you doing?" Nobody is ever allowed to open the teachers desk, and Keriso knows that perfectly well..
She ignored me and took a small cardboard box with a few holes punched in the sides out of her satchel. "Come and meet Gary," she said, grinning. I moved forward cautiously, hoping it wasn’t a spyder. Or a buzzer. I've got a thing about spyders and buzzers. Keriso took the lid off the box and out hopped a little green greeble. "Oh," I said, smiling with relief. "Isn't he sweet? Where did you get him?" "He was hopping about the lawn when I got up this morning," said Keriso. "I thought I would bring him in for the nature lesson. But then I had a better idea. I'll leave him in Miss Gest's desk and he'll hop out when she opens the lid and I bet she screams the place down." I doubted that very much. Miss Gest is the sort of Neopet who isn't frightened of anything. If she wrestled The Snowager she would probably win. "It'll take more than a greeble to scare her," I said. "Anyway, I think it's cruel. That poor little thing needs to be out in the fresh air. I think you're mean and I'm not going to have anything to do with it." Keriso stuck her tongue out at me and her face went all sulky as I stalked off back to the playground with my nose in the air. "Stuffy old spoilsport," she called after me. So I was surprised to see that she had got over her sulks by the time the bell went, and gave me a wink and a friendly smile as we all trouped in and took our seats. Miss Gest breezed in and rapped on her desk for silence. And I winced as I thought of that poor little greeble sitting there wondering if the sky was falling on its head. "Good morning class," boomed Miss Gest. "Good morning, Miss Gest," we chorused back dutifully. Miss Gest stood in front of the class and treated us to one of her nastiest smiles. "A nice little surprise for you this morning," she said. "Desk inspection." Our desks are supposed to be kept tidy at all times, but of course we forget and let them get in a bit of a muddle. Our old teacher always used to give us ten minutes tidy up before desk inspection, but not Miss Gest. She's too mean. Sometimes I think she only does these sudden checks so she can grab the odd can of neocola or chocolate bar that we're not supposed to have at school. Anyway, a great groan went rippling round the room and one or two of my classmates quickly lifted their desk lids and tried to craftily tidy up. But this wasn’t allowed. "All desk lids CLOSED," bellowed Miss Gest, and we all sank timidly into our seats and wondered who she was going to pick on first. And of course she picked Fibblet, the plushie Chomby, whose dad was the Kiko who owned the chocolate factory, and whose pockets are always crammed full of toffees and chocolates and stuff. "Fibblet, you can be first," said Miss Gest, striding through the desks towards where he and I sat together in the middle row. Fibblet went red and I heard him say something rude under his breath. Then I saw him quickly raise his desk lid and inch or two and slide a hand inside. And before I knew what was happening I found a big crackly cellophane packet being shoved into my lap. I looked down and my heart nearly stopped beating. Lying on my navy blue school skirt was a whole half pound bag of Sugarbunny Surprise. There was no time to shove them back because Miss Gest was already looming over us like a thunderstorm. I couldn’t slip them into my desk as mine was sure to be the next one to get inspected. So I did the only thing I could think of. I scooped them up under my cardigan and held them against my ribs with my elbow, hoping that Miss Gest wouldn’t notice the bulge. Fibblet's breath came out in a long whistle of relief. He opened his desk wide, looking smug as anything because the inside was as tidy as could be. "Very good, Fibblet," said Miss Gest. "I wish everyone could be as neat. Now lets have a look at yours, Eastly." I wasn’t worried about my desk. I knew I'd given it a good clear out last thing on Friday. So I got a nasty shock when I opened the lid and found right in the middle on top of my nicely arranged exercise books, a small cardboard box with air-holes punched in the sides. "And what might this be?" Enquired Miss Gest, pouncing on the box and waving it in the air. "It's um....er...it's a box," I mumbled turning pink and hunching my shoulders as I felt the bag of sweets start to slip out from under my elbow. "I can see that" snapped Miss Gest, and the whole class tittered. "But what's in it?" "Nothing," I whispered, looking daggers at Keriso, who was laughing up her sleeve. "It's empty." "Well, we'll soon see," said Miss Gest. And she opened the box an peered in. Everybody else craned their heads to look, but they were all disappointed because there was nothing but a few damp leaves and tufts of grass. "I'm waiting for an explanation, Eastly," said Miss Gest coldly. And I sat there not saying a word. I could hardly tell tales on my best friend, could I? Even if she had put the box in my desk to get me in trouble. Miss Gest pressed her lips together in a giant line and handed me the box. "Take that and put it on my desk," she said. "And you can stand in front of the class until you decide you have something to tell me." I shuffled to my feet, feeling the slippery bag of sweets slide even further down inside my cardigan. "And stand up straight," Miss Gest added impatiently. And she got hold of me by the shoulders and gave a good shake. And of course that’s when I finally lost my grip on the bag of sweets and it shot out of the bottom of my cardigan and clattered to the floor. Everybody laughed at my red face, and that spiteful royal Blumaroo, Natalay said "Oooh, Eastly Jones," as if I'd stolen Amira's crown. Miss Gest snatched up the sweets in triumph and took them back to her desk. She banged hard on the lid for silence. "That’s quite enough, everybody," she said. "As for you, Eastly Jones, you will stay in at playtime. And I shall want a full explanation of your behavior. Your sweets are, of course, confiscated." And I held my breath as she opened the lid of her desk. Well, that poor little greeble must have been half out of its wits with all the banging because as soon as the lid was open it gave a great leap straight into Miss Gest's face. And Miss Gest let out a shriek and jumped about half a mile in the air as if it was a nest of cobralls in there and not just one little greeble, and it just goes to show that even the toughest of Neopets are usually afraid of something. Anyway, it wasn’t Miss Gest I was worried about. I was feeling sorry for the poor little greeble. He had fallen on the floor and was now attempting pathetic little flopping jumps along the skirting board, cringing from the din everybody was making. I didn’t really stop to think. I ran out to the front of the class and picked up the greeble as gently as I could. I popped him back into his cool leafy box and put him safely away in my desk. But I soon wished I hadn't. The bedlam suddenly quieted and I looked up. There was Miss Gest, charging towards me, her face purple with rage. And it kept going white and then red and then purple again, like the disco lights at a birthday party. I won't tell you everything she said. But I can tell you that it took a long, long time. I had to stay in every playtime for a whole week, and I had to write out one hundred times 'I must not bring sweets to school,' and one hundred times 'I must not play practical jokes on my teacher'. Fibblet was ever so grateful that I hadn't told on him and he was nice as pie to me afterwards. He walked home with me from school and he went with me to set the little greeble free in a cool, boggy patch of ground near a stream. And he shared a box of chocolate Chias with me that he had hidden in his blazer in the cloakroom. And who should come following us along the road, smiling away as if nothing had happened, but Keriso. "Get lost Keriso Morris," I said in my best stuck up voice. "I'm fed up with you and all the trouble you get me into." And this time I really meant it.